Gateway Motorsports Park in St. Louis has always been a favorite of Stotz Racing. Not only have we won many races but we’ve also set many records there. The Summer heat has always made the track tough to get down quickly. With track temps nearing 140 degrees this year, I was glad to have had so many successful seasons there. It did take us Friday’s test session and into Saturday’s qualifying to get a hold of the track, but Frankie qualified well with the #2 spot. The last NHDRO race at the newly renovated Dragway 42 in Ohio showed us continuing our dominance with another #1 qualifying spot. The track was recently ground flat but that also takes off all the rubber needed for traction. The track crew and Rudy from QuickTime worked tirelessly to get it as good as possible. No records would be set this weekend but as long as both lanes are equal everybody has an equal shot at winning. We went low et of every round in eliminations. Going into the semi-finals there was a 1.5-2 hour delay. The track cooled and we took some power out of each gear but it wasn’t enough as the tire spun about three feet off the starting line. Even Frankie’s quick reflexes could not catch it in time. The rain came ten minutes later and the race will have to be finished in St. Louis. We still have a good points lead and looking to win again in St.Louis. Four time AMA ProStreet Champions Stotz Racing, first 200mph record and first Turbo Pro-Street in the Sixes (6.98) thank American Honda, prohondaoils.com, Dyno Dynamics, Sikora Precision, DME Racing, Al Lamb’s Honda, Falicon Crankshaft Components, BST Wheels by Brock, Robinson Industries, DC V-Twin, JE Pistons, MicroBlue Racing, Air-Tech Streamlining, M2 Shocks, ARP, Win Racing, Millenium Technologies,​ mobiledynamometer.com, and the newest Maxxecu.com. Stotz Racing–Winning ​Street Outlaws-No Prep-​ ​G​reat way to start the Season! Winning ​Street Outlaws-No Prep-​ ​G​reat way to start the Season! First and foremost I want to thank ​ Discovery Channels, Street Outlaws-No Prep show, Gary Macon ​and​ Chris Johnsen ​ for making this happen on very short notice​ . Thank you for what you guys are doing to help progress ​M​ otorcycle ​D​ rag Racing in front of ​the ​ 2 ​2,​ 000+ race fans and the 3.4 million viewers this show gets every Wednesday. Autographing little ​smiling ​ kids hats ​was the icing on the cake​ . We got the call two weeks ago ​ Thursday​ to attend ​ that weekends taping of​ the ​ S treet ​O​ utlaws ​ race at Galot Motor Speedway in NC airing April 18th. Unfortunately ​ both​ our ProStreet and Grudge CBR1000rr’s were in stages of completion for the Man Cup season opener in Valdosta, GA April 6-8, and NHDRO season opener in Atlanta, GA April 13-15. The crowd liked the bikes enough for the producers to ask Gary and Chris to see if they could get the bikes to the taping of the two hour season Finale this past weekend in Tulsa, OK. This time CJ (Chris) called with a whopping 4 days notice. We took parts from the ProStreet bike to complete the Grudge bike by late Thursday night and were in Tulsa 11 hours later. Special thanks to Kurt Sikora of Sikora Precision for helping us make this happen in very short notice. All of Chi-town helped in many ways. Craig ​ and Wally​ from ​F​ lowtech ​, Anthony at Fornarelli Racing, Doug at Legend Racing, Brian at Win Racing. ​The Discovery Channel has a GIANT social media program with many millions of followers. This show will air for many months in reruns also. Hopefully this is the start of some big things for Motorcycle Drag Racing and the Stotz Racing-Honda team. With 2015 coming to an end, the fresh start of 2016 is here. We spent the weekend with Steve and Allen of Dyno Dynamics promoting the new Dynotech line back in December. That show is must see to learn new ways to win in 2016. The R&D things we tried last season will ultimately give us the winning edge for this new season. For 2016 not only are we running ProStreet but we are also getting ourselves into the Grudge scene. We entered a grudge event at the end of last year and saw great promise for the Grudge bike we are building today. The ProStreet bike currently known as old red will benefit from all of the R&D and also get new bodywork and new paint. As far as our Grudge bike goes we are completely tearing down our blue R&D bike and starting from the bottom up to build the baddest 1K flat slick bike in the world. There has been a lot of buzz about us coming out with a grudge bike. The crowd knows how fast we have been in ProStreet now take any rules away and it’s pretty much ” Run what you Brung” and may the Baddest team win. We are hoping to get our grudge bike done in the next month with enough time to go down south testing before our first race in April. With that said it’s hard to express how excited we are for this next upcoming season of ProStreet and in our new adventure of Grudge Racing. Throughout the 2015 race season we had Al Crayton from MDRA follow us to around and get a behind the look at what it takes to run Prostreet and grudge at the top level. We have clips from us racing at Indy, testing up at our local track, and finally entering our first grudge event posted on our YouTube channel with 11 episodes to choose from. We look forward to the 2016 season and our continued partnership with Al Crayton for the 2016 season. Stotz Racing, home of the First 6 Second Turbo ProStreet Bike thanks; American Honda, Falicon Crankshaft Components, Star Racing, Rock Solid Mfg, Al Lamb’s Dallas Honda, JE Pistons, MicroBlue Racing, BST Wheels by Brock, Pro Honda Oils and Chemicals, Air-Tech Streamlining, Millennium Technologies, EPMPerf.com-HyperPro, Robinson Industries, WorldWide Bearings, Win Racing, ARP, TIAL Sport, mobiledynamometer.com. DME Racing, Sikora Precision, Dyno Dynamics, and Speed and Strength. This season we tested a new turbo system, new ECU and switched from race gasoline to Methanol. We did not plan to make 3 major changes (turbo, ECU, fuel) in one year. The Turbo and ECU were started before the 2014 season ended in an attempt to get us more horsepower. The fuel rule change allowing Methanol came after we were committed to the turbo and ECU projects. We found a significant power gain with the Methanol but it took us a while to harness the extra torque. The NHDRO season Finals, Sept. 25-27 at Indy saw us still in test mode with the methanol fuel and we finished out of the top 3 for the first time in 20 years. Many of our performance gains over the years have been negated by rules changes pushed forward by the growing number of Turbo Busa’a in ProStreet, now about 95% of the class. Anything other than a Turbo Busa is like fighting City Hall. We have beat City Hall many times and won 2 National Championships on our Turbo Honda’s. Now the Grudge Class has gained tremendous popularity and is basically a no rules, baddest man wins class. Kurt from Sikora Precision was in Valdosta showcasing his Chassis while crewing for us and we are now in the process of making one of our ProStreet bikes into a Grudge bike. We tested our ProStreet bike with a Slick (allowed in Grudge) and even with the limited wheelbase of our ProStreet swingarm went quicker than we have ever gone before. Bill from Robinson Transmissions said he can make a 123 auto for us (allowed in Grudge). JE Pistons can make a slipper style piston kit to fit the new Falicon Stroker Crank and Rods. Millenium Technologies can make the bore .5 mm wider and still have just enough room for the Pro Honda Genuine Parts stock head gasket to keep it sealed. Of course all this will raise the horsepower even more but the MicroBlue friction fighting process and the Honda Pro Oils HP4 20-50 will help it live. Airtech Streamlining is making the new bodywork more aerodynamic and lighter. With most of the major changes tests completed, Stotz Racing is now looking forward to next years race season with our eyes firmly on the prize. The Man Cup Motec Spring Nationals started out fantastic. Frankie and I went down a week early to visit my daughter Jacqui and her new fiance Jeff. Their new home was very comfortable and Jeff offered me space in his garage to finish the over the winter updates to our tried and true Red, White, and Blue CBR1000rr. The changes proved worthy of all of the time. In testing we recorded the quickest consistent times of 1.16 in the 60′ and 3.04 to the 330′. This was going to be a great weekend! Mother nature had other plans as we dodged rain drops until mid day Sunday when it was decided that it would not be possible to get the race done. We are going to Dyno Dynamics next week with the new bike and the new for 2015 methanol motor. These changes proved to be much more than just changing the fuel in the tank and upgrading the Fuel Lab system. We decided on new higher compression JE Pistons, Star modified the head for the larger volume of fuel and air, Falicon made the 3mm stroker crank, Millenium prepared the new dry block cases, and Robinson ProCut a new trans for the all new motor. We could not have done all this without the tremendous effort of our two new sponsors. TIAL Sport made a complete new turbo system with integrated wastegate, cast header, cool scoop and more! My friend Kurt Sikora from days gone by has been back into racing and has been invaluable with Sikora Precision’s fabrication of so many of the parts on the new bike and many on the old bike. Microblue Racing coated everything that rotates and Honda is back again with Pro Honda Oils and Chemicals keeping the metal parts coated with the HP4 20-50 racing oil. Mark Harrel of mobiledynomometer.com will provide his dyno and time as Steve Nichols of Dyno Dynamics works his magic on the tuning. Stay tuned for the next race report after the upcoming NHDRO Spring opener at Indy on May 15-17th. McBride was able to stay in the throttle longer to score the win. NHDRO’s first ever 6 second street legal pass on his Honda CBR1000RR. and hoping to finish the season with another Championship. back again is Joe Rocket thankfully protecting Frankies little body. reet bike to dip into the 6.80 zone but the track was too cold and they both spun with Ryan Schnitz getting the win. Our Cinderella dream did not pan out but we finished the season #2 in points and as they say here in Chicago (for the Cubs anyway) Wait till next year! 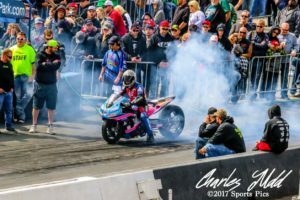 In 2009 motorcycle drag racing looked very bleak when AMA Dragbike closed its doors. Now at the end of 2012 it is stronger than ever with a record 800 entries at the Indy and Valdosta events and fans in the stands again. We will be chasing two great Pro Street Champions in Bud Yoder for the Man Cup and Rodney Williford for the MiRock series in 2013. Our new cbr1000rr will be at the spring event and hopefully we can test it sometime before that. We can’t wait to get another shot at the first side by side Six Second run in Pro Street history. We attended the 2Wheel Speed finals to try and win the NHRA Wally that Byron Dragway put up as it is now an NHRA sanctioned track. Saturday we qualified #1 and posted the quickest run of the day. After 5 rounds (2 qualifying- 3 elimination) the track was starting to lose a little bite. We overpowered the starting line and had to settle for runner-up. On Sunday the day to Win the Wally, there was 6 rounds of racing and the competition got tougher. We qualified #3 and aimed our efforts at not repeating the mistake of overpowering the track again. The track again posed problems of being loose from 100 feet to 500 feet. We honed our combination and in the final laid down the quickest ET of the event. Frankie did an excellent job of pedaling it when it spun in the 100-to 500 ft range but then went 196 mph out the back to win our second NHRA Wally. We are trying to attend the KOTS (King of the Street) event on Oct 6th. It is a highly attended free for all style event that you have to see to believe. I road our bike at the spring event but had a cam sensor wire with reversed polarity. This caused the bike to have 26 degrees less timing and become very sluggish. The timing is correct now and Frankie will ride. No one is allowed to use the new hand-slider type clutches or any centrifical lock-up. It is all spring pressure trying to hold back 450 hp. This should prove to be an interesting race. If time, money, and a spare motor all come together we are trying to make the Shakedown at E-Town. I will keep you posted on our results. Stotz Racing, home of the First 6 Second Turbo ProStreet Bike thanks American Honda, BST Wheels by Brock, Falicon Crankshaft Components, Star Racing, MicroBlue Racing, JE Pistons, Rock Solid Mfg, Air-Tech Streamlining, EPMPerf.com-HyperPro, Millennium Technologies, Mickey Thompson by PR Factory Store, Cycletek, WorldWide Bearings, Win Racing, ARP, Portable Shade, mobiledynamometer.com, and back again is Joe Rocket thankfully protecting Frankies little body.